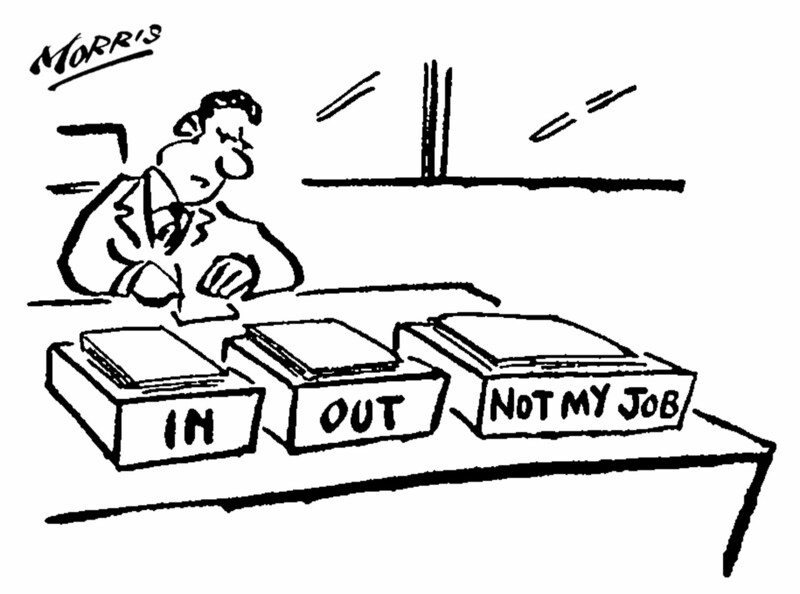 How often have you heard a co-worker say- "that's not my job, I'm not doing that" Sadly it has become common place in many offices. What happened to the team spirit and helping others, without being asked, even if it's not "in your job description"? I have seen far too many people succumb to this attitude and that is not going to help any business grow. I was at a client the other day, the garbage was full at the desk I was using, when I left I took it out. Another lady in the office was shocked and said "why are you doing that, that's not your job, so n' so has to do that" Ok, why? I'm leaving the building anyway and my car is parked close to the dumpster, so why not pitch in? I just don't get it... Seems to me like just plain laziness not to help. So how do we get attitudes to change? This potentially employment-ending habit is referring to the overall mindset of people who senselessly refuse taking on additional work even when it’s legitimately needed for the success of the team. There are times when we all have to do a little more to support others, even if it’s not specifically a part of our job description. That’s what it means to be on a team. Hopefully, at some point in the future, your co-workers will do the same for you. If you have the time available and knowledge to do extra work to help out a co-worker, do it. There’s no harm in acknowledging that you’re doing him or her a favor and optimistically they will do the same for you. It’s okay to say “no” in the workplace. However, you should show valid reasons, My workload is full to capacity already, I’m not trained in that function, etc. and the wrong reason, It’s not my job. Make sure that you are setting limits for a legitimate purpose, not simply because you don’t feel like being bothered. Give an earnest and equitable explanation as to why you can’t help right now. “It’s not my job,” is probably the most career damaging sentence muttered in the workplace. It’s like a toddler screaming, “No! I don’t have to do it and you can’t make me!” It doesn’t serve any useful purpose either. If you do have to say no, offer a sincere desire to resolve the problem. Suggest alternatives and help find solutions.